We found the perfect holder for the bottles of wine you picked up on your latest trip! 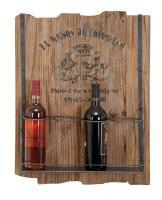 Bring the relaxed feel of the wine country to your space with this French Country Hanging Wine Rack. Crafted of wood and metal, this Tuscan style wine rack will enhance your decor while working double duty as a wine holder. For more details visit www.cheapchicdecor.com.